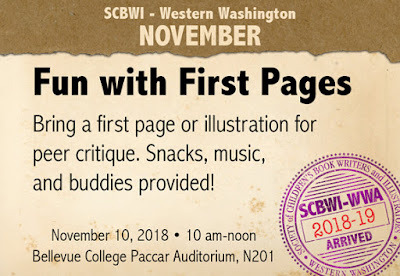 Chinook Update: November SCBWI WWA meeting, this Saturday! November SCBWI WWA meeting, this Saturday! 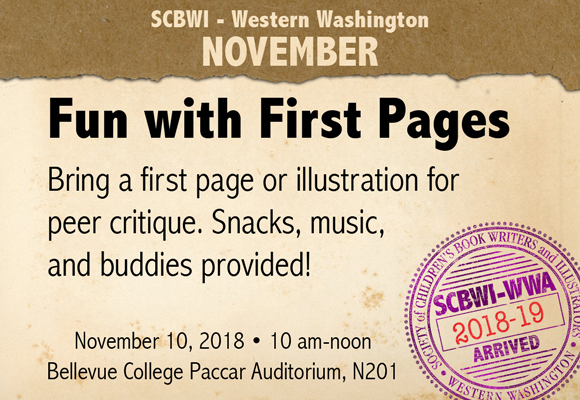 Our next SCBWI WWA meeting is this Saturday in Bellevue, and we're trying something new! Come to this monthly meeting where we will use this time to make announcements, break the ice, and share our first pages in small breakout groups with others who write in your age group. Enjoy this first-ever Passport offering--with tasty snacks, music, and writing buddies! For SCBWI members in Western Washington. Stay in touch and find out about local events, classes, and good news. Register for benefits here if you live in Western Washington. To send a link, blog post, good news, or calendar item, e-mail the editor, Kim Baker, at news.scbwiwwa@gmail.com. Questions, compliments, or suggestions? Please email us anytime at wwa@scbwi.org. We want to hear from you! Install Chinook Update headlines on your own blog. Congratulations, 2018-2019 SCBWI WWWA Mentees!